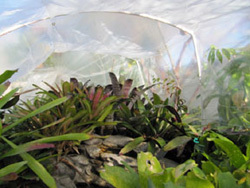 We don't need a Greenhouse all year round, but it would be nice to have one for the cold season, to protect those cold sensitive tropical babies. 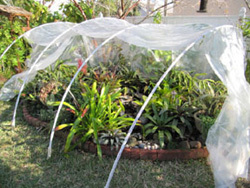 Talking to a good friend about my dilemma, she explained in detail how to create a seasonal hoop house. What a wonderful idea! This first year, hubby created one over the bromeliad collection, but I am sure he will be adding a couple more next winter. During the warmer days I just flip back the front part of the plastic sheeting. The thin and flexible PVC pipes are inserted into the larger PVC pipe sections and therefore bend to create a frame for the plastic. 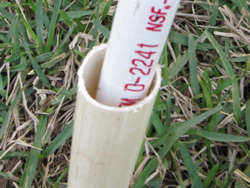 Cut 2-ft long sections of the larger PVC pipe and hammer it into the ground. Now just stick the thin PVC pipes in. You are done with the frame. The plastic sheets are available in different strength, we decided to use 3.5 MIL to hold up to stronger winter winds and for re-use next season. For fastening, hubby added grommets to the plastic sheet (Kits are available at the box stores) doubling the plastic at the seam for extra sturdiness. Tie the Nylon string to the grommet and the other end to the stake. 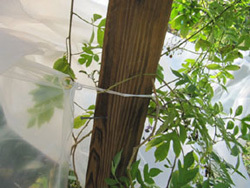 Existing structures are used to tie the plastic to. 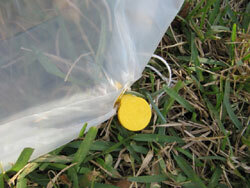 The grommets prevent the plastic from ripping. Hubby spaced the grommets about every two feet. 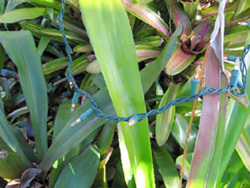 Accent solar lamps (not LED) provide a good heat source for the cold nights, but just to be save, I have added a Christmas light chain. Done. Here I peek in from the small side. It sure gets toasty warm in there.